We love nature in Maryland and there are so many nature centers to choose from that you can get to one from nearly anywhere in the state, without driving for more than an hour. Each one has its own unique features so make your weekend selection based on the type of animals you want to learn more about. Here is our top ten list of nature centers in Maryland. The Patuxent Research and Nature Center is the nation’s only national wildlife refuge established to support wildlife research. Right outside of Washington D.C., this area is entirely secluded and much of it is fenced off. By the nature center you will find trails, a pond to watch the birds and an indoor center full of exhibits on climate change. It is an eye-opening experience and completely free. This nature center is very hands-on for the kids with a touch tank where they can both see and feel a variety of local wildlife. With a friendly staff that makes it easy for kids to learn, this is the perfect afternoon destination only 20 minutes from Baltimore. Plus, there are beautiful walking trails to enjoy. With a 17,200 square-foot exhibit hall, this is one of the largest nature centers in the area. They have both indoor and outdoor classrooms where adults and kids can learn about the local environment. Plus, there is an amphitheater for specific events and performances. If you want to take a quiet walk, you can do so as well. With interactive exhibits and stuffed animals for kids to touch and play with, even toddlers will enjoy it here. Sandy Point is mostly famous for its location right at the entrance to the Bay Bridge. Beautiful views and the largest public beach in the area make for a busy summer spot. Few people realize that it also has a nature center. At this 786-acre park, the nature center showcases local wildlife and includes hands-on displays where kids can touch and feel and even dress like a park ranger. This nature center is unique because instead of being focused on local wildlife, the focus is on flora and fauna with some animal exhibits. One of the favorite things at this center is their butterfly exhibit. There are moderate hiking trails for exercise and an outdoor play space for kids. You can host your child’s next birthday party here since they have excellent play spaces for kids with puzzles, toys, and interactive exhibits for kids to learn about nature and animals. It is somewhat smaller than some other nature centers but still an excellent place for kids. Our favorite thing about Clearwater is its location. Surrounded by a huge park with a variety of hiking trails to choose from, you can head here to hike and then stop in the nature center to take a break and learn more about what you just saw outdoors. 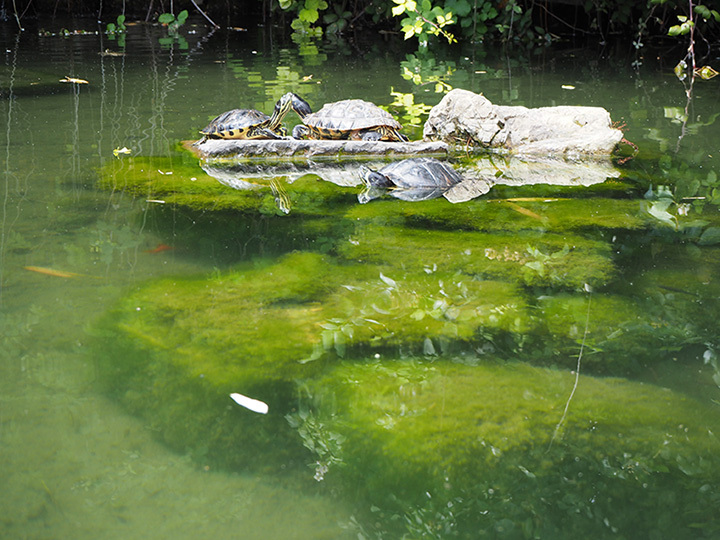 This is a small nature center but the best spot for anyone who loves turtles. You can feed them here if you bring your own food. It is open on the weekend and free to visit with nice trails and a playground for kids. One reason to go here is to participate in their classes and programs. You can join Nature Pals with your toddler or learn how to make “fairy” furnishings during their Rustic Art program. They have exciting classes for kids here led by a knowledgeable staff, allowing your kids to learn more than they would on a self-guided tour. This is a fairly new nature center with a huge building, classrooms, exhibits, and outdoor play area. There is a butterfly garden where you can sit, relax and observe along with live animal displays and walking trails. The coolest thing about Meadowside is the indoor spelunking area where kids can play. That portion is entirely unique for nature centers and your kids will love it. When done, they can dress up like colonial settlers, hang out in the aquarium and view local wildlife. It’s free and a ton of fun. View more Maryland Nature Centers and Botanical Gardens.